In 1928, Snappes and van Creveld provided the first description of 2 patients with GSD III (see Online Mendelian Inheritance in Man [OMIM]). Both patients had hepatomegaly and reduced ability to mobilize hepatic glycogen stores. In 1953, Forbes provided an extensive clinical description of a third patient with GSD III and suggested that the glycogen in both liver and muscle tissues had an abnormal structure. Illingworth and Cori isolated the glycogen from the tissues of this patient and showed that it had extremely short outer chains. This structure had previously been termed a limit dextrin by Cori and Cori, specifically to identify a glycogen molecule that had been extensively hydrolyzed by phosphorylase (ie, the enzyme that cleaves the alpha1,4-glycosidic bonds that form the linear backbone of glycogen) but that contained all of the alpha1,6-glycosidic bonds that formed the branch points of the original glycogen molecule. Cori and Cori predicted that the patient's condition was caused by a debranching enzyme deficiency. See the image below. Schematic illustration of the degradation of glycogen by the concerted action of the enzymes phosphorylase and debranching enzyme. First, phosphorylase removes glucose moieties (linked to their neighbors via alpha1,4 glucosidic bonds and depicted as the 7 black circles) from the unbranched outer portions of the glycogen molecule until only 4 glucosyl units (depicted as the 3 green circles and the 1 red circle) remain before an alpha1,6 branch point. The transferase component of debranching enzyme then transfers the 3 (green) glucose residues from the short branch to the end of an adjacent branch of the glycogen molecule. The glucosidase component of debranching enzyme then removes the glucose moiety (depicted as the red circle) remaining at the alpha1,6 branch point. In the process, the branch point formed by the alpha1,6 glucosidic bond is removed, hence the name debrancher.Unlike phosphorylase, which removes glucose moieties from glycogen in the form of glucose-1-phosphate, debrancher releases 1 free glucose moiety from each branch point. After the cleavage of the branch site, phosphorylase attacks unbranched portions of the glycogen molecule until the enzyme is stymied by the appearance of another branch point, at which point debranching enzyme once again is called into play. Eventually, large portions of the glycogen molecule are degraded to free glucose by the action of the amylo-alpha1,6-glucosidase activity of debranching enzyme and to glucose-1-phosphate by the action of phosphorylase. Only 4 years later, Illingworth, Cori, and Cori demonstrated the enzyme deficiency in GSD III in 1956. Thirty-six years after his initial 1928 report, van Creveld, with the aid of Huijing, demonstrated deficient debranching activity in his original patients. The clinical status of both patients had significantly improved since their conditions were originally described in 1928. Although Snappes and van Creveld's patients with GSD III were the first individuals in whom a defect in glycogen metabolism was reported, Cori and Cori demonstrated in 1952 that the absence of glucose-6-phosphatase activity was the enzyme defect in GSD I (von Gierke disease). Indeed, GSD I was the first inborn error of metabolism in which the precise enzyme defect was identified. Since 1952, the various GSDs have been categorized numerically by the chronologic order in which the enzymatic defects were identified. The sole exception to this general rule is GSD type 0, which is not a true GSD because the quantity of liver glycogen in this condition is less than the amount in healthy individuals. Moreover, the hepatic glycogen in this condition has an entirely normal chemical structure. In recognition of their pioneering work on the structure, synthesis, and metabolism of glycogen, the husband and wife team of Carl F. Cori and Gerty T. Cori were corecipients of the 1947 Nobel Prize in Physiology or Medicine. This award came 5 years before they had defined the nature of the enzymatic defect in GSD I. First, GSD I is widely believed to be the most common of the GSDs, and GSD III is considered relatively rare. In fact, 2 large studies have demonstrated GSD I, GSD III, and GSD VI incidences to be approximately equal. Collectively, these 3 types account for approximately 80% of GSD cases. GSD II, which is actually a lysosomal storage disease, accounts for an additional 15% of all GSD cases. Moreover, because GSD III can have a mild clinical presentation, its incidence may be underestimated. Second, a common belief is that the hypoglycemia experienced by patients with GSD I is much more severe than the hypoglycemia experienced by patients with GSD III. Although this usually is true, many patients with GSD III have hypoglycemia as severe or even more severe than the hypoglycemia experienced in GSD I. Fourth, approximately 85% of patients with GSD III have significant involvement of both the liver and the skeletal muscles, a form of the disease referred to as GSD IIIa, which is a fact that is often overlooked. Muscular involvement usually is minimal during childhood but often becomes the predominant feature by young adulthood. Progressive muscle weakness and distal muscle wasting frequently become disabling as the patients enter the third or fourth decade of life, although this condition has been reported to begin in childhood in many Japanese patients. Fifth, muscular involvement can also involve the heart. Cardiomegaly is not rare, and a few patients have developed a dilated hypertrophic cardiomyopathy. The disorder is confined to the liver in only 15% of patients with GSD III. Understanding the clinical abnormalities of GSD III requires familiarity with the structure and function of both glycogen and glycogen debranching enzyme. The polysaccharide glycogen is a readily mobilized storage form of glucose. Because glucose is the primary energy source for most mammalian cells, the survival advantages of having a readily available storage form of this carbohydrate are obvious. Although glycogen serves this essential function in virtually every organ, the liver and the skeletal muscles are the major sites of glycogen storage. Smaller concentrations of glycogen are found in almost every tissue, even in the brain. Although the concentration of glycogen per gram of tissue is much higher in the liver than in muscle, the total amount of glycogen stored in muscle is much larger than the amount stored in the liver because of the relative masses of the 2 organs. The importance of this energy resource can be appreciated by noting that the free glucose content of the body fluids of a child who weighs 10 kg is approximately 5 g, whereas tissue glycogen content, even after fasting 10 hours, is approximately 25 g.
Glycogen is a highly branched polymer of glucose in which most of the glucose residues are linked to each other by alpha1,4-glycosidic bonds to form a linear backbone (see the image below). Schematic representation of a portion of a molecule of glycogen. Open circles represent the glucose moieties connected to each other via alpha1,4 linkages. Solid circles represent the glucose moieties connected to their neighbors via alpha1,6 linkages. Thus, each solid circle represents a branch point in the molecule. 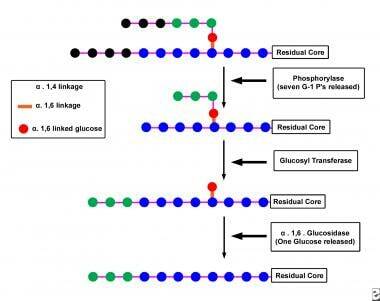 Interspersed along the linear backbone, at intervals of 4-10 glucose residues, are branches created by alpha1,6-glycosidic bonds. 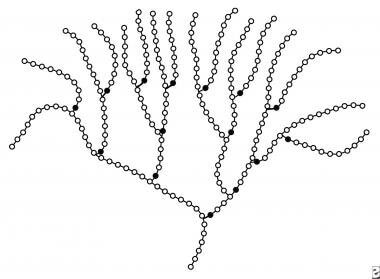 As a result of the extensive branching, the glycogen molecule has a frondlike and highly branched configuration with an open helical tertiary structure. The helix, in turn, is organized into spherical particles with a molecular weight of 10-15 million (60,000 glucose residues per particle), and the spherical particles, in turn, are organized into large granules. The granules range in size from 10-40 nm and are located in the cellular cytosol. Although glycogen is most abundant in liver and muscle, it has 2 quite different primary functions in these tissues. In muscle, glycogen is employed as a fuel source (ie, a source for the production of ATP) during brief periods of high energy consumption. In contrast, glycogen's major role in the liver is as a key player in the complex process of glucose homeostasis. During times of energy abundance (eg, after a meal), the liver takes up glucose and nutrients that it can convert into glucose (primarily amino acids, galactose, fructose, lactate, pyruvate, and glycerol, but not fatty acids) from the bloodstream and converts these nutrients to glycogen. Conversely, when blood glucose levels fall, the liver catabolizes glycogen to glucose via a series of exquisitely regulated hydrolytic reactions referred to as glycogenolysis. Glucose is then available for delivery to tissues that cannot synthesize the carbohydrate in significant quantities (eg, brain, muscle, erythrocyte). Not surprisingly, the predominant features of GSDs that primarily involve muscle are muscle cramps, exercise intolerance, easy fatigability, progressive weakness, and myopathy; in some cases, cardiomyopathy is a feature. In contrast, the predominant features of GSDs that primarily involve the liver are hepatomegaly, hepatic dysfunction, and hypoglycemia. Debranching enzyme (usually called debrancher) is a large protein composed of 1,532 amino acids organized as a single polypeptide with a molecular mass of approximately 170,000 daltons. This enzyme is unusual in that it is among the few proteins with 2 independently functioning catalytic activities located at separate sites on a single polypeptide chain. The 2 catalytic activities of debranching enzyme are a transferase, oligo-1,4-1,4-glucanotransferase (EC 2.4.1.25), and a glucosidase, amylo-alpha1,6-glucosidase (EC 3.2.1.33). Complete degradation of glycogen requires the concerted action of the enzymes phosphorylase and of both debranching enzyme components. Phosphorylase first removes glucose moieties (see the image below), which are linked to their neighbors via alpha1,4-glucosidic bonds from the unbranched outer portions of the glycogen molecule until only 4 glucosyl units remain before an alpha1,6 branch point. Then, the transferase component of the debranching enzyme transfers the 3 glucose residues from the short branch to the end of an adjacent branch of the glycogen molecule. The glucosidase component of debranching enzyme then removes the glucose moiety remaining at the alpha1,6 branch point. In the process, the branch point formed by the alpha1,6-glucosidic bond is removed, hence the name debrancher. Unlike phosphorylase, which removes glucose moieties from glycogen in the form of glucose-1-phosphate, debrancher releases 1 free glucose moiety from each branch point. After cleaving the branch site, phosphorylase attacks unbranched portions of the glycogen molecule until the enzyme is stymied by the appearance of another branch site, at which point debranching enzyme is once again called into play. Eventually, the entire glycogen molecule is degraded to free glucose by the action of the amylo-alpha1,6-glucosidase activity of debranching enzyme and to glucose-1-phosphate by the action of phosphorylase. The glucose-1-phosphate may be used in various biosynthetic reactions, or it may be converted to glucose-6-phosphate by the action of phosphoglucomutase. The glucose-6-phosphatase so formed may be used for energy production via either the glycolytic or the hexose monophosphate pathway, or it may be converted to free glucose by the action of glucose-6-phosphatase. Hypoglycemia is the primary clinical manifestation of GSD III. At least in its early stages, hypoglycemia is caused by the defect in glycogenolysis that results from deficient activity of debranching enzyme. Because of deficient debrancher activity in GSD III, only a small portion of the glucose moieties stored in the liver as glycogen is readily available for glucose homeostasis. As a result, patients may experience significant hypoglycemia, even after a relatively short fast. However, in contrast to patients with GSD I, gluconeogenesis is normal in patients with all forms of GSD III. This probably explains why the hypoglycemia observed in patients with GSD III is usually less severe than that routinely encountered in patients with GSD I. Nonetheless, be aware that patients with GSD III can experience hypoglycemia sufficiently severe to induce hypoglycemic seizures and to cause brain damage and even death. An entirely realistic goal, given modern treatment modalities, is reduction of the incidence of all hepatic complications by preventing bouts of hypoglycemia. Stabilizing blood glucose levels within the reference range significantly reduces incidence of hepatic adenomas and hepatocellular carcinoma in patients with GSD I. No theories explain why hepatic signs and symptoms of GSD III usually improve with advancing age and even may disappear after puberty. Similarly, patients with GSD III catabolize fatty acids normally because the activity of acetyl CoA carboxylase or levels of malonyl CoA do not significantly increase. As a result, the hypoglycemia of patients with GSD III is often accompanied by significant fasting ketosis, a combination that does not occur in patients with GSD I. Patients with GSD IIIa apparently have a generalized debrancher activity deficiency, which has been identified in the liver, skeletal muscle, heart, erythrocytes, and cultured fibroblasts. Research has demonstrated that the progressive myopathy and/or the progressive cardiomyopathy develop only in patients with this generalized debrancher activity deficiency. In addition to GSD IIIa and GSD IIIb, 2 relatively rare forms of the disease are termed GSD IIIc and GSD IIId. Only 1 or 2 cases of GSD IIIc are documented, and its clinical manifestations have not been fully described. GSD IIIc has intact debrancher transferase activity but deficient glucosidase activity. Because no patient with this form of GSD III has been reported in the past 20-30 years, this condition may have been a "family disease." The molecular biological basis for this rare form of GSD III is unknown. No reliable estimates of GSD incidence are available because of the lack of newborn screening programs for these disorders. The estimated incidence of GSD III in North America is approximately 1 case per 100,000 live births. GSD III has been reported in several racial and ethnic groups, including white Europeans, Africans, Hispanics, Jews, Aboriginal North Americans, and Asians. GSD III is especially frequent among Sephardic Jewish people from North Africa; all affected people in this group have GSD IIIa. All forms of GSD III occur with equal frequency in both sexes because the disorder has autosomal recessive inheritance. GSD III is an inborn error of metabolism; the condition is present from the moment of conception. Age of first clinical appearance varies dramatically from patient to patient. Hypoglycemia is rare in neonates but often manifests at age 3-4 months, an age when many parents reduce feeding frequency. Hepatic symptoms may be so mild that the diagnosis is not confirmed until adulthood, when the patient first manifests signs and symptoms of neuromuscular disease. Cirrhosis may lead to hepatocellular carcinoma. Some patients develop hypertrophic cardiomyopathy, yet overt cardiac dysfunction is rare. Teach all caregivers and sufficiently mature patients how to recognize signs of impending hypoglycemia. Teach all caregivers and sufficiently mature patients how to manage hypoglycemic episodes. Teach all caregivers and sufficiently mature patients how to measure blood glucose levels. Teach all caregivers how to insert an nasogastric tube (NGT) and how to use an infusion pump. Provide intensive nutritional education to caregivers and sufficiently mature patients. Encourage sufficiently mature patients to participate in the dietary management of their disease. Chen YT. A novel point mutation in an acceptor splice site of intron 32 (IVS32 A-12&#174G) but no exon 3 mutations in the glycogen debranching enzyme gene in a homozygous patient with glycogen storage disease type IIIb. Hum Genet. 1999 Jan. 104(1):111-2. [Medline]. Chen YT. The Metabolic and Molecular Bases of Inherited Disease. New York, NY: McGraw Hill; 2001. Vol 1: 1521-51. Sentner CP, Hoogeveen IJ, Weinstein DA, Santer R, Murphy E, McKiernan PJ, et al. Glycogen storage disease type III: diagnosis, genotype, management, clinical course and outcome. J Inherit Metab Dis. 2016 Sep. 39 (5):697-704. [Medline]. [Full Text]. Dagli A, Sentner CP, Weinstein DA,. Glycogen Storage Disease Type III. Adam MP, Ardinger HH, Pagon RA, Wallace SE, Bean LJH, Stephens K, Amemiya A. GeneReviews. December 29, 2016. Seattle (WA): University of Washington, Seattle; 1993. [Full Text]. Forbes G. Glycogen Storage Disease. Report of a case with abnormal glycogen structure in liver and skeletal muscle. J Pediatr. 1953. 42:645-52. Illingworth B, Cori G. Structure of glycogens and amylopectins, III. Normal and abnormal human glycogen. J Biol Chem. 1952. 199:653-9. Illingworth B, Cori G, Cori C. Amylo-1,6-glucosidase in muscle tissue in generalized glycogen storage disease. J Biol Chem. 1956. 218:123-30. Snappes I, Van Creveld S. Un cas d'hypoglycemie avec acetonemie chez un enfant. Bull Mem Soc Med Hop (Paris). 1928. 52:1315-7. Demo E, Frush D, Gottfried M, et al. Glycogen storage disease type III-hepatocellular carcinoma a long-term complication?. J Hepatol. 2007 Mar. 46(3):492-8. [Medline]. Coleman RA, Winter HS, Wolf B, Chen YT. Glycogen debranching enzyme deficiency: long-term study of serum enzyme activities and clinical features. J Inherit Metab Dis. 1992. 15(6):869-81. [Medline]. Labrune P, Trioche P, Duvaltier I, et al. Hepatocellular adenomas in glycogen storage disease type I and III: a series of 43 patients and review of the literature. J Pediatr Gastroenterol Nutr. 1997 Mar. 24(3):276-9. [Medline]. Verbeek RJ, Sentner CP, Smit GP, Maurits NM, Derks TG, van der Hoeven JH, et al. Muscle Ultrasound in Patients with Glycogen Storage Disease Types I and III. Ultrasound Med Biol. 2016 Jan. 42 (1):133-42. [Medline]. Ko JS, Moon JS, Seo JK, Yang HR, Chang JY, Park SS. A mutation analysis of the AGL gene in Korean patients with glycogen storage disease type III. J Hum Genet. 2014 Jan. 59(1):42-5. [Medline]. Ben Rhouma F, Azzouz H, Petit FM, Khelifa MB, Chehida AB, Nasrallah F, et al. Molecular and biochemical characterization of a novel intronic single point mutation in a Tunisian family with glycogen storage disease type III. Mol Biol Rep. 2013 Jul. 40(7):4197-202. [Medline]. Shen J, Bao Y, Liu HM, et al. Mutations in exon 3 of the glycogen debranching enzyme gene are associated with glycogen storage disease type III that is differentially expressed in liver and muscle. J Clin Invest. 1996 Jul 15. 98(2):352-7. [Medline]. Shin YS. Glycogen storage disease: clinical, biochemical, and molecular heterogeneity. Semin Pediatr Neurol. 2006 Jun. 13(2):115-20. [Medline]. Zimakas PJ, Rodd CJ. Glycogen storage disease type III in Inuit children. CMAJ. 2005 Feb 1. 172(3):355-8. [Medline]. [Full Text]. Santer R, Kinner M, Steuerwald U, et al. Molecular genetic basis and prevalence of glycogen storage disease type IIIA in the Faroe Islands. Eur J Hum Genet. 2001 May. 9(5):388-91. [Medline]. Parvari R, Moses S, Shen J, Hershkovitz E, Lerner A, Chen YT. A single-base deletion in the 3'-coding region of glycogen-debranching enzyme is prevalent in glycogen storage disease type IIIA in a population of North African Jewish patients. Eur J Hum Genet. 1997 Sep-Oct. 5(5):266-70. [Medline]. Lee PJ, Deanfield JE, Burch M, et al. Comparison of the functional significance of left ventricular hypertrophy in hypertrophic cardiomyopathy and glycogenosis type III. Am J Cardiol. 1997 Mar 15. 79(6):834-8. [Medline]. Dagli A, Sentner CP, Weinstein DA. Glycogen Storage Disease Type III. 1993. [Medline]. Bernier AV, Sentner CP, Correia CE, et al. Hyperlipidemia in glycogen storage disease type III: effect of age and metabolic control. J Inherit Metab Dis. 2008 Dec. 31(6):729-32. [Medline]. Matern D, Starzl TE, Arnaout W, et al. Liver transplantation for glycogen storage disease types I, III, and IV. Eur J Pediatr. 1999 Dec. 158 Suppl 2:S43-8. [Medline]. Cleary MA, Walter JH, Kerr BA, Wraith JE. Facial appearance in glycogen storage disease type III. Clin Dysmorphol. 2002 Apr. 11(2):117-20. [Medline]. Hadjigeorgiou GM, Comi GP, Bordoni A, et al. Novel donor splice site mutations of AGL gene in glycogen storage disease type IIIa. J Inherit Metab Dis. 1999 Aug. 22(6):762-3. [Medline]. DiMauro S, Hartwig GB, Hays A, et al. Debrancher deficiency: neuromuscular disorder in 5 adults. Ann Neurol. 1979 May. 5(5):422-36. [Medline]. Manwaring V, Prunty H, Bainbridge K, Burke D, Finnegan N, Franses R, et al. Urine analysis of glucose tetrasaccharide by HPLC; a useful marker for the investigation of patients with Pompe and other glycogen storage diseases. J Inherit Metab Dis. 2012 Mar. 35(2):311-6. [Medline]. Wolfsdorf JI, Weinstein DA. Glycogen storage diseases. Rev Endocr Metab Disord. 2003 Mar. 4(1):95-102. [Medline]. Lucchiari S, Pagliarani S, Salani S, et al. Hepatic and neuromuscular forms of glycogenosis type III: nine mutations in AGL. Hum Mutat. 2006 Jun. 27(6):600-1. [Medline]. Schüller A, Wenninger S, Strigl-Pill N, Schoser B. Toward deconstructing the phenotype of late-onset Pompe disease. Am J Med Genet C Semin Med Genet. 2012 Feb 15. 160(1):80-8. [Medline]. Kishnani PS, Austin SL, Arn P, Bali DS, Boney A, Case LE, et al. Glycogen storage disease type III diagnosis and management guidelines. Genet Med. 2010 Jul. 12(7):446-63. [Medline]. Lee P, Mather S, Owens C, et al. Hepatic ultrasound findings in the glycogen storage diseases. Br J Radiol. 1994 Nov. 67(803):1062-6. [Medline]. Vertilus SM, Austin SL, Foster KS, Boyette KE, Bali DS, Li JS, et al. Echocardiographic manifestations of Glycogen Storage Disease III: increase in wall thickness and left ventricular mass over time. Genet Med. 2010 Jul. 12(7):413-23. [Medline]. [Full Text]. Austin SL, Proia AD, Spencer-Manzon MJ, Butany J, Wechsler SB, Kishnani PS. Cardiac Pathology in Glycogen Storage Disease Type III. JIMD Rep. 2012. 6:65-72. [Medline]. [Full Text]. Markowitz AJ, Chen YT, Muenzer J, et al. A man with type III glycogenosis associated with cirrhosis and portal hypertension. Gastroenterology. 1993 Dec. 105(6):1882-5. [Medline]. Gremse DA, Bucuvalas JC, Balistreri WF. Efficacy of cornstarch therapy in type III glycogen-storage disease. Am J Clin Nutr. 1990 Oct. 52(4):671-4. [Medline]. El-Karaksy H, El-Raziky MS, Anwar G, Mogahed E. The effect of tailoring of cornstarch intake on stature in children with glycogen storage disease type III. J Pediatr Endocrinol Metab. 2014 Aug 20. [Medline]. Haagsma EB, Smit GP, Niezen-Koning KE, et al. Type IIIb glycogen storage disease associated with end-stage cirrhosis and hepatocellular carcinoma. The Liver Transplant Group. Hepatology. 1997 Mar. 25(3):537-40. [Medline]. Iyer SG, Chen CL, Wang CC, et al. Long-term results of living donor liver transplantation for glycogen storage disorders in children. Liver Transpl. 2007 Jun. 13(6):848-52. [Medline]. Hershkovitz E, Forschner I, Mandel H, Spiegel R, Lerman-Sagie T, Anikster Y, et al. Glycogen storage disease type III in Israel: presentation and long-term outcome. Pediatr Endocrinol Rev. 2014 Mar. 11(3):318-23. [Medline]. Shen J, Liu HM, McConkie-Rosell A, Chen YT. Prenatal diagnosis and carrier detection for glycogen storage disease type III using polymorphic DNA markers. Prenat Diagn. 1998 Jan. 18(1):61-4. [Medline]. Yang BZ, Ding JH, Brown BI, Chen YT. Definitive prenatal diagnosis for type III glycogen storage disease. Am J Hum Genet. 1990 Oct. 47(4):735-9. [Medline]. Bhuiyan J, Al Odaib AN, Ozand PT. A simple, rapid test for the differential diagnosis of glycogen storage disease type 3. Clin Chim Acta. 2003 Sep. 335(1-2):21-6. [Medline]. Okuda S, Kanda F, Takahashi K, et al. Fatal liver cirrhosis and esophageal variceal hemorrhage in a patient with type IIIa glycogen storage disease. Intern Med. 1998 Dec. 37(12):1055-7. [Medline]. Shaiu WL, Kishnani PS, Shen J, et al. Genotype-phenotype correlation in two frequent mutations and mutation update in type III glycogen storage disease. Mol Genet Metab. 2000 Jan. 69(1):16-23. [Medline]. Shen JJ, Chen YT. Molecular characterization of glycogen storage disease type III. Curr Mol Med. 2002 Mar. 2(2):167-75. [Medline]. Siciliano M, De Candia E, Ballarin S, et al. Hepatocellular carcinoma complicating liver cirrhosis in type IIIa glycogen storage disease. J Clin Gastroenterol. 2000 Jul. 31(1):80-2. [Medline]. Van Creveld S. Chronische hepatogene Hypoglykamie im Kindesalter. Z Kindern. 1932. 52:299. Van Creveld S, Huijing F. Differential diagnosis of the type of glycogen disease in two adult patients with long history of glycogenosis. Metabolism. 1964. 13:191-8. Wolfsdorf JI, Crigler JF Jr. Effect of continuous glucose therapy begun in infancy on the long-term clinical course of patients with type I glycogen storage disease. J Pediatr Gastroenterol Nutr. 1999 Aug. 29(2):136-43. [Medline]. The authors and editors of eMedicine gratefully acknowledge the contributions of previous author Howard R Sloan, MD, PhD to the development and writing of this article.